Preheat the oven to 350°F. Cut the pears in half and place on a baking sheet (I cut a sliver off the other end so they sat upright). 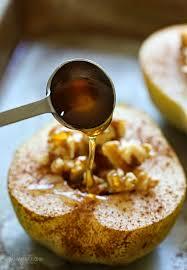 Using a measuring spoon or melon baller, scoop out the seeds.